One of few last regions where Bon Religion still exists in its primitive form is Dolpo. Some of the Bonpo Monasteries in Dolpo are the oldest existing ones. Bon was the prevailing religion in Tibet before the majority of Tibetans adopted the Buddhism. 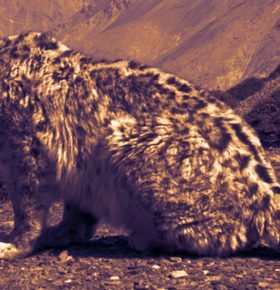 Though Bon and Tibetan Buddhism existed side by side for ages, the present form of Bon adapts the fusion form of Bon and Buddhist principles hence; the indigenous form of Bon seems to fade out. The origin of Bon Religion relates to the myths of sacred figure Tonpa Sherub who lived in Western Tibet. Bon emphasis its religious grounds more on spirits and deities rather than the philosophy and hence the religion is sometimes regarded as Shamanism. The Bon practices are the key factors that differentiate the religion with Tibetan Buddhism. Circumambulating the shrine anti-clockwise unlike Buddhists undertake the process clockwise. Similarly, revolving the prayer wheel to left and inscribing swastikha to the left are Bon’s practices whereas; Buddhists perform these rituals to the right. In addition, chanting mantra of the Bon is “Om Ma Tri Mu Ye Sa Le Du” but the Buddhists chant “Om Mani Padme Hum”. Bon also distinguishes itself from Buddhism on interpreting ancient teachings, religious dance forms, costumes and masks used during ceremonies and the patterns of religious paintings and statues. Explore Dolpo’s Bon Sanctuary Trek takes you the several fascinating Bon Monasteries of Dolpo. Come join the Bon Sanctuary Trek with us. From Kathmandu we take a bus or fly on any domestic carrier to Nepalgunj. Nepalgunj , a town in the western Terai , is very close to the Indian border and the Bardia Nationl Park. It is a major transport hub for western, mid-western and far-western regions of Nepal. Overnight at hotel or lodge. Flight from Nepalgunj takes you to Jumla. It takes nearly half an hour. Jumla is the regional head quarter. There several government and non-government offices. The only Technical School KTS is also located there. 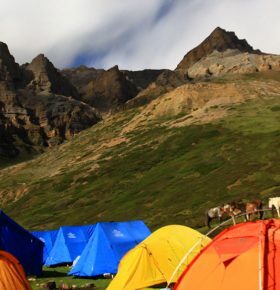 Overnight in a hotel at Jumla- your trek starting point for Bonpo Sanctuary Trek. Today the Bonpo Sanctuary Trek begins. As we trek today, we traverse through sub-tropical forest, frequently emerge to several mountainous villages and at the end of the day's trek after 5-6 hrours we arrive to our campsite in a small village, Gothichaur. The second day of the Bonpo Sanctuary Trek is no different to the first day. However, we shall gain elevation. At the end of the day's trek we arrive to Chotra campsite for the overnight stay. From Chotra the trail leads you through all the important Bon Gompas. The one located here is Yungdrung Droduling Gompa. 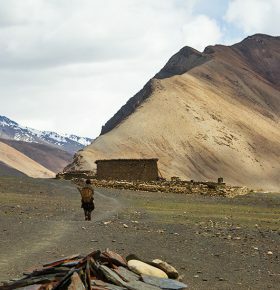 Here you can interact with Lamas and the people about the culture and tradition of Bon and the importance of the Gompa. From Kaingaon the trail goes uphill through woods of pine and silver birch and takes you to the top of the small pass called Balangra (the pasture land). Then the trail descends to Ghodakhor where there are some houses with hotels. Then the trail leads you to the place called Khaliban. You will have a night stay at this place and visit Munri Sursum Gompa the Bon Gompa. 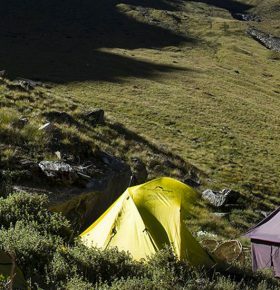 Today the Bonpo Sanctuary Trek winds through the low alpine woods all the way to Karelikanda. On the way, we visit the Sipu Kyalmo Gompa , which is the revered monastery in the region. Overnight in the camps at Karelikanda. From Karelikanda the trail descends towards Dunai the district headquarter of Dolpo. Just across the river there is a Bon Stupa and Bon school. This is the very first Bon School which is managed by the respected Geshe Nyima Kunchap Rokaya. The school has all the facilities of lodging, food, modern education along with their traditional teachings of Bon. Since the Stupa and all the infrastructures of the school and the running cost are all managed by only person the respected Geshe, the construction of Gompa has left behind. This is in the proposed future plan ant this will be the central Gompa for the Bon sect of Dolpo district. The trail through several clusters of houses and villages takes you to the village of Baijibara. There are some teahouses on the way. The trail is straight at first and slowly ascends. Nearby the village there is a sacred site, where people go to pay their homage on especial occasions. There is an old Gompa that has been established nearly centuries ago. Since the infrastructure of the Gompa has been in collapsing condition the respected Gehse has protected the old Statue providing extra protections. This Gompa holds enough legends to explore about the existence and the survival of Bon in Dolpo. Explore the Gompa and stay overnight in the camps at Baijibara. Today, we retrace on the trail we trekked yesterday and arrive to Dunai. Overnight in a lodge at Dunai. The real adventure of Bonpo Sanctuary Trek begins today. As the trek begins we initially trek along classic trekking route of Dolpo via Kararsialchaur Temple to Sulighat, which is pretty much comfortable walk along the leveled trail . We shall produce the trekking permit to Dolpo and the Shey Phoksundo National Park Permit at the Sulighat Check-post. Now we are officially inside Shey Phoksundo National Park. Beyond Sulighat our trek follows the trail beside Phoksundo River till Kageni. As the trek goes further, the landscapes in the vicinity begin to change. We trek through the lush tropical forest frequently emerging at isolated mid-hill villages like Jutung and arrive to Shyangte. At Shyangte we cross the bridge twice- once over Phoksundo River and once over the confluence of Phoksundo Khola and Maiaba Khola and begin to head north towards Chhepka. Trekking upstream along the trail beside Phoksundo Khola for a while we arrive to Chhepka. We put our camps at an ideal location in Chhepka for the overnight stay. From Chhepka the trail goes through woods and streams by the sides viewing several waterfalls. The journey will be pleasant with the cool natural environment and will stop for the day at the village Pugmo. This is a typical Bon village where you can visit Namgyal Lakhang Gompa/Techen Rabgyaling Gompa. The 13th day Bonpo Sanctuary Trek has pleasant walk. From Pugmo the trek starts with slightly uphill walks and takes you to a lonely place where there is a Bon School name as Taparicha. Overnight in the camps at Taparicha. On the way to Phoksundo you will go through the head quarter of Shey Phoksundo Nationl, Polam and then uphill viewing the water fall of Phoksundo from the top. After a few minutes’ gently downhill walk you will reach to the lake. Phoksundo is the deepest lake of Nepal which is well known among the visitors for its brilliant colour too. There are some Bon Gompas by the side of the lake that deserves a great values of Bon culture. There are several legends that explains the interconnection of Bon culture and nature. Today we explore the area around Ringmo Village and the magnificent Phoksundo Lake. First, we explore around Ringmo Village and head to Tshowa (the lake-shore Bon Monastery). The Bon Gompa nestling a ridge top above Phoksundo Lake was built about 900 years ago.Exploring this culturally rich Bon Monastery is fascinating experience. Then we drop down to Phoksundo Lake along steep-sided cliffs. The lake is famous for its magnificent turquoise color and spectacular scenery. Ringmo village, a typical Tibetan village, is scenic view from Phoksundo Lake. Many beautiful glaciers can be found near and above the lake area. There are many monasteries (Gompas )and Bon-po religious sites at the park and we spend our time visiting some of these. We also explore the wonderful natural sites and enjoy our nature tour. Today’s trek is probably one of the best trekking days of Bonpo Sanctuary Trek. It climbs along the narrow trail cut on a cliff standing vertically straight above Phoksundo Lake. This treacherously fascinating trail brings us to another side of Phoksundo Lake. This particular part of the trek is like fantasy walk portrayed by a writer in their fiction novels. To get to the Phoksundo Khola camp on other side of the lake, we slide down for ninety minutes along the beautiful forests. Beyond the Camp, we trek along Phoksundo Khola, the river that feeds water to the lake to Sallagahri. The majority of the trek goes through the sandy shores of Phoksundo Khola whereas; the final part of today’s trek slides up to the beautiful campsite at Sallaghari. Enjoy the nights in the camps amongst beautiful pine forest. Today’s trek is relatively short; we trek for almost three hours to reach Kangla Base Camp 4100m. As the trek begins we ascend up the narrow defile of Tuk Kyaksa River. The trail switches to opposite side of the river several times. Soon we arrive to a place where the rapids of the river are calmer. We cross the bridge over the river at that point. Thirty minutes of walk after the bridge, we come across the wide valley followed by two hours of walk along the canyon brings us the potential campsite. A walk for a while further reaches to the massive rock slab, which is Kang La Base Camp- our campsite for the night. Today we trek to the fabled Shey Gompa and the nearby 'Crystal Mountain', the most sacred peak in Dolpo which Dolpo pilgrims circumambulate each summer before the harvest. 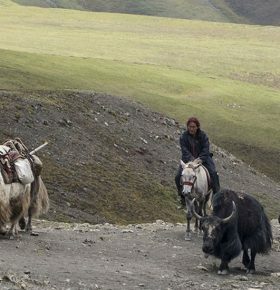 We are now entering the real Dolpo, and to enter into this mystical land we have to cross the Kangla pass . The trek to the top of Kang La Pass is along the graveled trail uphill for three continuous hours. However, all the efforts put to come up to the top of pass rewards us with wonderful views. The eyefeasting views from the Kang La Pass includes Cyrstal Mountain, the mountains in Tibetan territory and the mesmerizing landscapes of Dolpo. We also have views of the peaks Shey Shikkar and Kang Chunne, both just over 6000 meters, before descending steeply down to the valley floor and along the river. A red chorten marks the entrance to Shey, where we camp for the night. Trekking along the trail that caters the views of true Tibetan landscapes beyond Tibet, today the Bonpo Sanctuary Trek with Explore Dolpo heads to the campsite at Shyamling Gompa. This Gompa is regarded as the oldest gompa of the region and very worthwhile exploring. Actually the Bonpo Santuary Trek today heads towards Saldang. However, to get to Saldang from Shyamling in a day is quite unlikely. So, we trek the whole day and arrive to a campsite for the overnight stay. 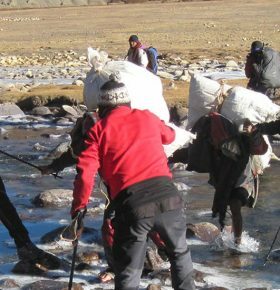 The trek throughout the day is wonderful and Explore Dolpo makes sure you will have the perfect location for the campsite. Continue the trek towards Saldang. We will have relatively shorter trek day and take your time and enjoy savoring the magnificence of nature throughout the trek today. Overnight in a camp at Saldang. By the way Saldang is one of the major villages in Dolpo, so you will have lots of things to explore around Saldang. 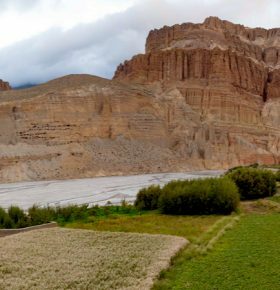 The latter half of Bonpo Santuary Trek follows the trail that exits out of Dolpo and enters the forbidden kingdom of Mustang. Today, we trek up to the campsite in Rakyor. Most of the times during the trek today, we chase the trail beside the river and the the excellent landscapes that is barren yet so beautiful.. Overnight in a campsite at Rakyor. The Himalayan Region in the west is so remote that, we don't get to see so much of human activities. In few occasions, the trekkers do not see the settlements for hours or even days. Today, we trek in such regions. Trekking for almost 5-6 hours we get to an ideal campsite that lies right in the middle of Rakyor and Takyu. Today, we will have an interesting trekking day as we will be gaining a little bit of elevation up to the Changla Pass and eventually slide down to the village of Takyu for the overnight stay. Today's trekking takes us to the trading center of Upper Dolpo Region, Dho. Dho Tarap is a fascinating settlement that manifests the real attributes of Dolpo. This famous settlement of Dolpo nestles high above a wide valley and was a famous trading point to the traders of Tibet and Mustang in the ancient days. We will settle down our camps at Dho Tarap for the overnight stay. The Bonpo Sanctuary Trek today exits out of Dho and Upper Dolpo and heads towards the pass that differentiates Upper Dolpo and Mustang. However, the journey isn't that simple. we need to trek for few days. Today we arrive to a campsite in one of the ideal locations in between Dho and Chharka. Overnight in a camp. The trek now has enter Mustang Region. Today, the Bonpo Sanctuary trek, goes to Jharkot, where there is a Bon Gompa. We explore the gompa and then head towards the famous revered site Muktinath. Muktinath a sacred site for Hindus, Buddhists and Bons is a edifice built in Newari architecture style. Explore the religious site and enjoy the overnight in a teahouse at Muktinath. The last day of Bonpo Sanctuary Trek, treads to the village of Lubrak and explores the Bon Monastery in Lubrak. Officially the trek ends once you trek down to the windy city from Lubrak.